I have put off publishing this for long enough. I have been fretting over it for a LONG dang time, and I just need to get it out there! Phew. Okay.....here.......goes. I LOVE THIS SHOW, I LOVE the people running it, and I LOVE the town of Sonora!! The only reason we can't do it this year is because I had scheduled a show in Texas the previous weekend, and so my options for these dates (March 7th-9th) were to either drive to Sonora (A 30 hour trip, ONLY if Donner's Pass isn't closed, which would make it a 40 hour trip...with no stops. *shudder*) OR I could do the Wild West Steampunk Convention in Arizona....which is not quite as far from my Texas show. This was one of the hardest decisions I've ever had to make for my business. I dearly love this show, the cast, the vendors, the people who run it....it's a great family. I've been doing the show for 8 years now, 4-5 weekends out of every single year. When I really started looking carefully at numbers, which I try not to do (which is idiotic for someone who runs a business), I was horrified. Truly, it was just not enough profit for the time spent. I had to be away from my sewing shop for over a month, not producing any inventory, which meant I didn't sell a thing online for the whole month, plus, all of that time off made it so all of my shows in the first part of summer suffered. I hate the whole "It's not personal, it's just business" thing, but...well...it's a thing. -There is this jump that a lot of vendors have to make where they decide to let other people manage their booths for 8 weekends at a time, and they have to farm out their production to other countries like Mexico and India to have enough inventory to do these gigantic shows and actually make a profit. That is completely their own decision, and as HUMANS, they are just doing what they think is best. It's not my personal wish to send production of my products to other countries. When you come to a festival and handle our wares, I have put stitches and personally touched EVERY SINGLE PIECE. I try to be the best quality inspector that I possibly can. I'm truly very passionate about the actual integrity of the piece. I'm not ready to send that thousands of miles away. I don't know if I'll ever be ready. -Gas is expensive. We're lucky if we can get 10 miles to the gallon. The trailer we pull is about 8,000 pounds, fully loaded. I have looked into having things shipped (hideous) freighted (eek) or even sent on a train, and there is just so much logistical horror to all of it that it makes me panic and I don't want to run this company any more. Maybe one day I'll grow up and figure out how to fly me, my employees, my children and our 8000 pounds across country in an efficient, cost effective manner..until then, I've got to stick to shows that are slightly nearer to us. If you're wary of buying something online when you've never tried it on in person, don't be. I've sent out hundreds of thousands of corsets to women I've never met all around the world. All they did was measure and follow directions. I try my very best! -When someone tells me to do a show because I "will sell out" I always have a quick rush of pure rage. You don't ever "sell out" in a business where you have such a range of sizes and colors. Just because your booth is being rushed doesn't mean you'll have something for every last person that wants to buy (wouldn't it be beautiful, though??) I know it's immature to get frustrated when I hear these comments, and I know that the people truly mean to offer advice in the kindest possible manner. I suppose the issue is that all of these things are my most stressful parts of the actual job, thus I'm needlessly sensitive. I love sewing and creating, but terrified of traveling and all of the chaos around setting up for a show. Either way, I do apologize profusely to all of you who are going to be disappointed. Like I said, these might not be permanent decisions, but for this year, I'm just trying to do my best. As always I appreciate your support more than I can possibly say, and I'm so grateful for all of the women who have enriched my life. Do you know which shows you will be at yet? Shows are so hard. That is why I'm so glad I'm not running two arts festivals a year anymore. Don't beat yourself up about it! Are you still doing the Norman Fair in Oklahoma? I loved seeing you at both shows but I can make do with only one. I love seeing all your beautiful work. Muskogee will not be the same without you but do what you have to do for your business and we'll all be better for it! Gah! Crossing my fingers for NorCal pirate fest . Will miss you sooooo much in Sonora, but I understand. We will miss you horribly in Oklahoma, but I truly understand your reasons. You're a brilliant woman and an amazing seamstress! I hope that it's not good bye for forever! The Castle Of Muskogee will seem so empty without your shop. I personally hope all your wishes, dreams come true! Don't apologize for putting it out there--the reasons why you make the business decisions you do. People who have never been in business for themselves have no clue about all the factors that go into a business sinking or swimming. Thus they look at a business only from their personal "I want" and "why can't you" basis and try to tell an artisan how to run their business without understanding the ugly reality of paying the "rent"; that time away from the shop is production time lost; and that the price of each item has to also cover the cost of being at the event (which also includes food, lodging, supplies, display fixtures, etc), getting to the event, as well as the extra labor costs associated and sundry other expenses. 1. For the chandelier skirt - is the waistband elastic? 2. For the new hoods - Will they tie or be wearable without one of your corsets? 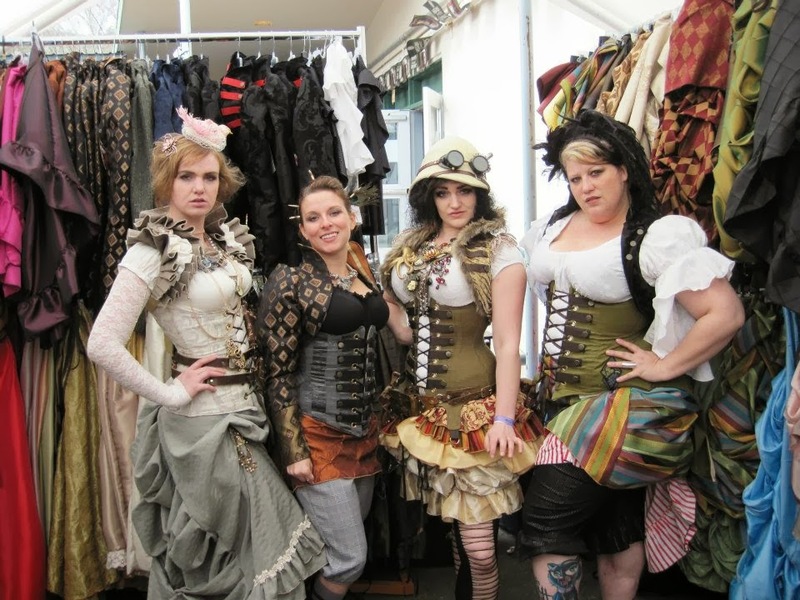 What about if I only have an underbust without shoulder grommets? You are so sweet and loving, I am sorry it causes you stress when you are unable to do all that others want of you. Take a deep breath, realize that for every complainer, there are so many more who love you and love what you do. Thank you for the personal touch and all of your encouragement. It is wonderful what you do. I understand why you can't do it, but I'm seriously crying that you can't come to Muskogee. It's where I found you, it's my home fair and the only one I normally get to go to. I'll try to go to Norman this year. I honestly don't know if I even want to go to Muskogee this year since you won't be there. As one of your Australian fans who might never get to meet you in person - I love what you do, I love your corsets, and I love that instead of trying to pretend to be some super perfect human being, you are an honest, caring and sharing woman. Although I haven't been able to buy one of your corsets for a while, believe you me, the minute I have some extra cash, I'll be adding to my already large collection of Damsel corsets! You can always find DressVenus Jackets something new, something trending and be sure of the best deal. Wow, it's so cool! Maybe you can try this style. It will make you a refreshing feeling. We're going to Norman this weekend. Looking forward to seeing you there! Oh too bad for NCPF. Are you still on etsy? I need some corset coats.